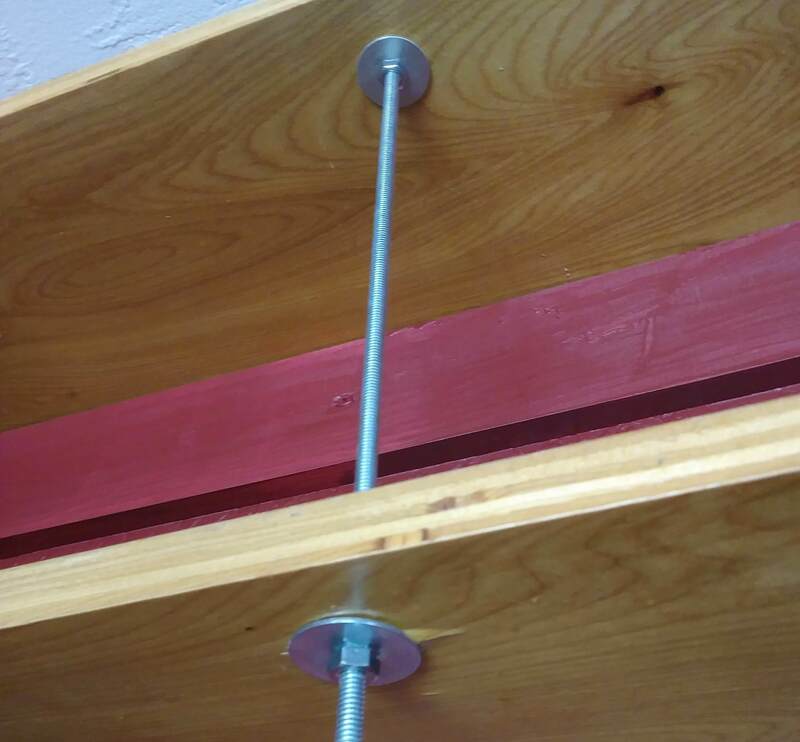 How can I prevent the nuts in my shelving from coming loose? So I got "creative" with these shelves I installed. Looking for ideas to keep these nuts from loosening. I considered just gluing them in but that would make it annoying in future if adjustments are required. I know they have nuts that specifically are supposed to not loosen but that requires me taking it apart more than I'd prefer. If you use a product known generically as anaerobic thread locker, you will prevent the rotation of the fastener unless it is done by a wrench. Locktite™ is one such brand name, although many other names abound. Do not use the red version, as it is nearly permanent, requiring application of intense heat to release. Blue is medium and holds well under vibration, while green is considered low strength. For your application, one would expect even green will work well, although in my experience it is rare to see it on the shelf. You can find threadlocker in red and blue at most auto parts stores and certainly in a well stocked hardware store. Until I read the Loctite page, I wasn't aware there is also purple threadlock. As noted in the text from the web site, use caution on selecting the product. The packaging/bottle color is not a good indication of the holding strength. The answer is simple: Lock washer. It looks like a washer but it's split, and slightly bent to form a spring compression against both surfaces and locks them together. Hence, "lock washer." There are various types of lock washers (I'm technically referring to a "split washer"). The split ones are most common. They're simple, cheap, and effective. Check out the Wikipedia article on washers (or Google) for pictures of split washers. They're available at almost any store with a hardware aisle. 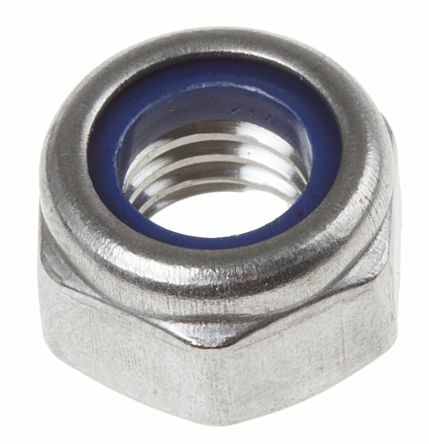 An even cheaper solution is locknuts, which are different to nyloc nuts. Locknuts are simply second nuts threadded on at the same time as the main load bearing nut. Then you oppose the two nuts by tightening them against one another. 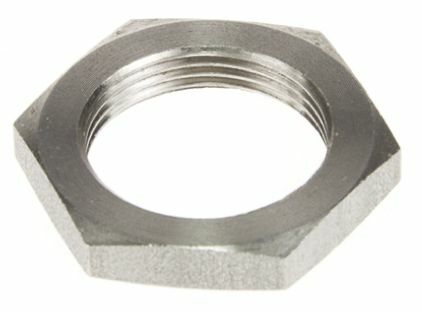 Locknuts are often thinner, and strangely they cost more than normal nuts, so its totally workable to use two normal nuts threadded onto the rod together. This technique is used in bicycle wheels, where one nut is a bearing race, and the outside is held in position with a thin locknut. Its only expensive pro bikes in the last decade have gone away from this, the vast bulk of bikes still use this. My car's wheel bearings are held on by two 2 1/8" nuts, cinched against each other in this matter. and here's a locknut - as you can see its quite thin. Post fab, your only choice is threadlocker as Fred describes, or really, any sort of glue will do, maybe even nail polish. two nuts, and fix them by cranking them in opposite directions so they bind. "Nylok" or other binding nuts. However this is a nightmare to assemble because they will not easily turn, and you must turn them rather far... All the while struggling to hold the threaded rod firm without damaging the threads (which would make it impossible to disassemble). pipe or tubing as a sleeve around the threaded rod, which then allows you to tighten the screws, putting the sleeves in compression which binds the nut. Of course the tube lengths define the spacing and are not adjustable. My preferred solution is to use locknuts, which have a nylon insert that grips the nut. Or, as fred_dot_u mentioned, Loctite. A simple dab of clear silicone calk will also to the trick. Apply it where the threads of the rod exit the existing nut. I often had these situations especially in installing professional light equipment. The best (and cheapest) solution I found was adding a second nut. First you use your first nut to find the desired distance, than you get your second nut to this location. While keeping the first nut on its place with a wrench, tighten the second nut with another wrench. Or, post-installation, drill a small hole through the nut and rod and place a locking pin or wire in the hole. See Hairpin Locking Pin. The trouble will be finding one small enough. You can re-drill later if you end up changing the configuration (or switch to nylon nuts). I suspect they will not move in any noticeable way. It depends on lots of things like vibration and force that the nuts are resisting. I would suggest just leaving it alone and seeing if you have anything to fix. Use A 1/4 inch tie wrap to grip the threads below the nut. Not the answer you're looking for? Browse other questions tagged shelving or ask your own question. How much weight can single-track shelving mounted on brick wall hold? How do I attach storage shelving/rack to the floor? How can I build pull-down shelving for kitchen appliances? How can I build garage shelving out of 2x6s, 4x4s and 1/2" OSB? How can I build a shelving unit like this? How to build floating shelving? How do I put up shelving that won't sag? Power Miter Saw, Hand Miter Saw, or Jig Saw? Can I use slot shelving in a wooden shed?